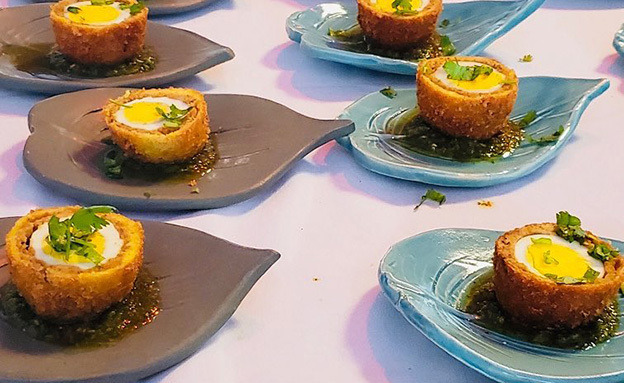 Scotch Egg… Chef Noori-style! Made with @earthsechofarm beef and wonderfully spiced. This was served at UGK: Retrospective dinner in Charlotte. Photo courtesy of UGK. The Richmond-based Underground Kitchen has had the honor of being asked to cook at the James Beard Foundation in New York City in the early summer. This is their biggest event to date! 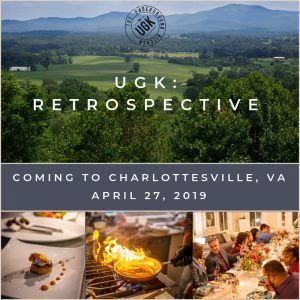 As a lead up to the event, UGK has launched their “UKG: Retrospective” tour which is in the process of crisscrossing the Mid-Atlantic and will include a dining event in Charlottesville on April 27. Underground Kitchen, the celebrated Richmond-based experiential dining society, is known for hosting high-style, multi-course dinners in secret locations with renowned and up-and-coming chefs across the Mid-Atlantic. UGK was founded in 2013 by design and branding expert Micheal Sparks as a community pop up dinner series. Since then, it has expanded to nearly 30 cities across the Southeast while maintaining its community-driven philosophy. With each event, UGK crafts a distinctive experience that revolves around a unique theme, location, and menu. It has been referred to as “the most exclusive dining ticket in town” by the Richmond Times-Dispatch. Why is UGK so secretive? Details are limited to heighten the aura of suspense. Before the event, only a few pieces of information are divulged – the date and time of the dinner and the theme. THAT’S IT. The exact menu, chef, and location are kept secret (in most cases) until 48 hours before the event. As is tradition with each Underground Kitchen event, the exact location for the April 27th dinner in Charlottesville remains a secret, but we can reveal the dinner will be at a landmark cultural locale in the city.